I'm signed up to receive Google Alerts for the titles of all my books so that I can immediately share good reviews and weep at bad ones. Today Google informed me that one of my books, Corporate High School, was listed on an educational website. I thought, "That's cool. Maybe it's another classroom where they're teaching the text." I clicked on the link. It turned out, it's a website where people go to buy plagiarized term papers. In an effort to see if they actually carried papers already written about Corporate High School, I entered my name and email address. I didn't hide my identity at all; anyone looking at my listing would see the same name as the the one on the cover of the book. Within minutes, I had emails from dozens of people offering to write papers on the book for me. I realized I didn't want to be associated with a company that provides this type of "educational services" and unsubscribed. One intrepid woman grabbed my email off the list before I disappeared and sent me a direct email outside the company's system (something the company would probably frown on, so I won't reveal her full name). I responded very carefully. "I'm curious," I wrote. "Have you read the novel Corporate High School?" "Hi Benjamin," she replied. "Yes i[sic] once did in a public library. I got a preview of it here." And she sent me a link to the listing for the novel on Goodreads. It’s possible she has read the book, but I was skeptical. I wrote, "That's wonderful! What public library carries it?" "Its[sic] located in Nairobi, the capital city of Kenya. However, the library is currently closed for renovations upto[sic] early next month." 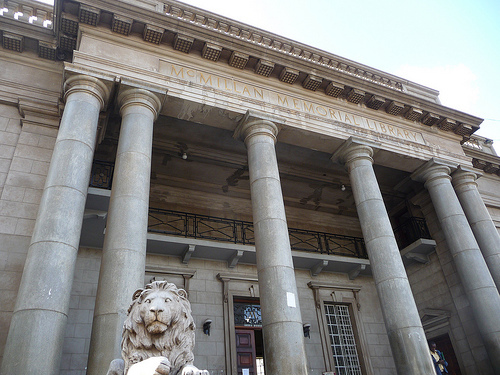 Ann could have been talking about the McMillan Library in Nairobi. Turns out it is currently closed for renovations. Perhaps there's a copy of Corporate High School inside? Again, this is possible, but I think it's highly unlikely. It seems especially convenient that the library is currently closed. I didn't see a reason to try to call her out on it, though, since I don't actually want to spend a bunch of money to get an essay about the book. I didn't reply. She reached out again. "Do you have a softcopy of the book?" I decided to break the news to her as gently as I could. "I have hardcover and paperback copies ...because I'm the author of the book. I received a note from Google Alerts saying there was a reference to the book. I am not interested in a term paper about the book, but I'm glad to hear it is being read. Thank you for brightening my day!" She was very pleasant about it, and we're now conversing about what a wonderful city Nairobi is, and how I should look her up when I come to visit someday. But I can't get over how ridiculous the Internet has made this tiny world we live in. There are 9,183 miles between Independence, Oregon, where I live, and Nairobi, Kenya, where my new friend lives. (For point of reference, the circumference of the Earth at the equator is only 24,901 miles, so Ann is almost the full 12450.5 miles to the exact opposite side.) Thanks to a Google Alert and some curiosity, she was able to offer to help a student cheat by providing that student with a paper about a young adult novel he hadn’t read (and which, I suspect, she has not read either), a paper he would turn in to his teacher. Only she was offering that paper to the author of that novel who is also a teacher! I should feel doubly cheated (triply? quadruply? ), but I can’t. It’s just too perfectly bizarre.